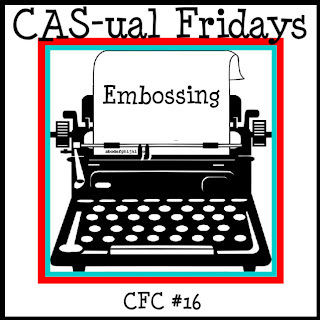 You know I love my critters, and all of my cutesy stamps, but once in a while I get asked to make something more "elegant." Hee hee. in less than a week! Where did the summer go? Sofia is off to grade 1, with her crazy list of 20 no.2 HB pencils, 4 40-oz glue sticks, 8 32-page Hilroy notebooks, and on, and on, and on.... this isn't kindergarten anymore for sure! And Thomas - heading into his 2nd year of preschool...with his tiny preschool backpack and 1 kleenex box... I'm excited to see what they'll both learn this year! In honor of the whole back-to-school rush, I used this week's MIM technique to create my faster-than-lightning bus. Sofia was appalled when she spied my out-of-the-lines coloring! I think she might have even muttered to herself, something about how she never colors out of the lines anymore... ha! Kids! I used "generation stamping" to make it look like the bus is in motion. I inked up the bus only once and stamped it at full strength on the right. Then, without re-inking, I stamped it again a few more times, each time moving my hand slightly to the left. I think the freestyle coloring works really well with the generation stamping technique! Have a great Friday, and a wonderful weekend! A gingham-dress-turned-sky, and a jar full of garden-freshness. I loved the ribbon that was tied around the neck of her jar, so I stamped onto my seam-binding to mimic the look. I punched a 1.75" scallop circle shape, and burnished it with my bone folder (ignore the blatant Martha Stewart product placement!) until the fibers of the paper broke down enough to gently pull them apart. I then scrunched each scallop circle and placed one on top of the other. You can mold them even better if you gently mist them with water... Add a rhinestone or button in the center, and voila! Another kind of floral embellishment. I don't have much chatter for you this morning - something about the first day back from vacation, back to being alone with the 3 kids for the first time in 2 weeks... it's all I can do to catch my breath! I dusted the box of some of my SU stamps - time to give them some love as well... I stamped the "ornate blossom" image onto some cream cardstock and clear embossed it. I then layered a hero arts text background, and an old SU background stamp called "sanded" over the top. The embossed image "resists" any ink you lay over it - I love this technique! I then went to town with a few colors of distress inks, until I was happy with how it looked. 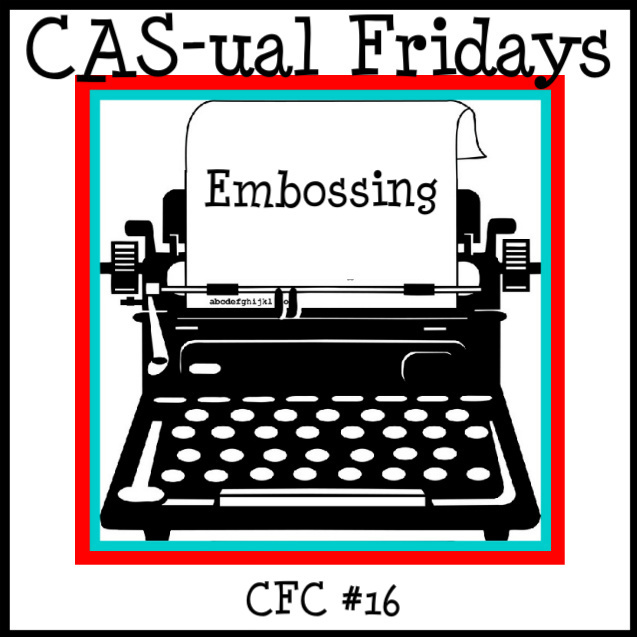 This week's CAS-ual Fridays challenge is: embossing! I am so in love with this card... and my new camera lens :) I added a 50mm lens to my Canon and the blurred background it gives is just the sweetest for photographing my cards... I can't wait to learn a bit more of what it can do! The vintage cream cardstock (PTI) was embossed with an SU embossing folder. It gives such a gorgeous texture! I die-cut an angled label and stamped on it in tumbled glass distress ink with the coordinating image. The sentiment is from a PTI mat stack set. The same vine border that lays horizontally across the card was used to cut melon berry felt, and rolled into that scrumptious flower. Nichole Heady showed how to create one on her blog - it's worth the effort! 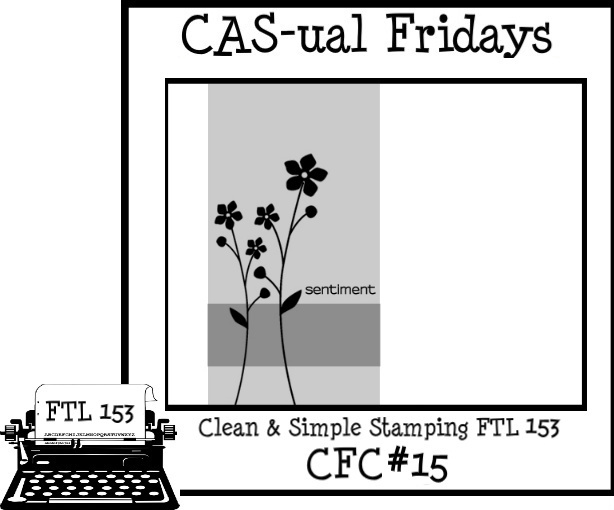 I stamped the newsprint background over my white mat, distressed the edges, and cut into it with my "turning a new leaf" die, and popped it up on foam squares. In the negative space, I stamped the coordinating leaf image. Do you ever make 1 layer cards? Do you find it easy? I find it pretty difficult to created enough interest on a card with no layers - I think my foam squares were feeling a bit put out that they stayed in their drawer for this one :) But they call them "challenges" for a reason, right? 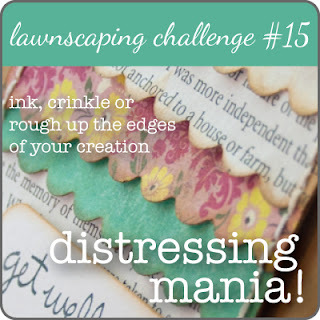 And it's the new one over at the lawnscaping blog. Having caught up on all the laundry and cleaning that obviously didn't get done while we were away, I thought I'd jump into one of my favorite weekly challenges: CAS-ual Fridays! I think this will be the wedding card that I give to my cousin for her upcoming wedding. My mom already claimed this card for herself :) This card was inspired by one I had seen on Carrie's blog some time ago. I started out by stamping my kraft base with PTI's sheet music background stamps. The next layer, SU's baja breeze cardstock, was stamped with the text stamp from PTI's background basics: hearts. A-M-O-U-R was stamped using lawn fawn's quinn's abcs and colored in with copic markers. I cut out the center of the letter "O" and popped the whole panel onto foam squares, allowing some room for glittery red hearts underneath. I know it's quite casual for what will be a very elegant celebration, but that's never been my style - I love a quirkier wedding card! We're back from the beach! One week in sunny, beautiful VA beach was exactly what our little family needed... the memories will last a lifetime. In a little under 2 weeks, my cousin Julie will be married! So, that means a slew of wedding cards on the blog. Why a slew? Because I have to create one from me, one from my mom, and one from my sister. Of course. It took so long for my new PTI order to get to me that it was my first time playing around with these goodies! I used the half & half die collection, the vine die, the wonderful words die - all PTI. The half & half die strip was embossed with my favorite SU square lattice embossing folder. When distressed, it shows off even more wonderful texture! The roses are MFT, the mini-rolled-rosettes. A little bouquet of flowers for the bride and groom. I die-cut the vines from a very subtle patterned paper (sorry, I can't reference it!) and left enough room on the right to stamp a strip from the coordinating set. I hope you like it! I have to admit that after a good 10 days of not crafting, I felt a little rusty trying to create this one. I had so much fun making my long birdie card, that I wanted to create another card in that 4x9 size. 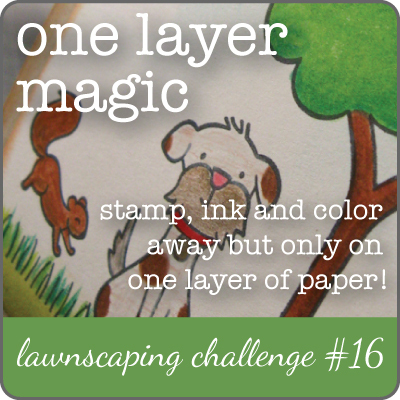 I stamped the adorable dog from lawn fawn's "critters in the 'burbs" and fussy cut it out before coloring him in. He was mounted onto some PTI gridlines cardstock with foam squares. I used PTI's 2.5 inch circle die collection to cut the kraft medallion layer, and then snipped some scrap patterned paper (I think it's leftover SU, but not sure). The long white layer was stamped with PTI's chevron stripes and then distressed. That was mounted to a layer of early espresso cardstock and then again to riding hood red (both SU). I'm counting this as my final entry into the lawnscaping challenge! I'm so thankful for the chance to share that magic with my own children! There is something healing about watching kids play at the beach - the sand in their chubby toes, their chicken legs running with a bucketful full of water - spilling most of it on their way back... we're loving it! Our family is off to the beach this morning! A 14-hour drive with 3 kids in the back of a Honda Accord. We have DVDs, we have snacks, and we have the hope that we'll arrive in VA beach with our sanity intact - ha! As we leave for a waterfront week, enjoy this Christmas-y creation! I'm entering it into a challenge over at SimonSaysStamp and also counting it as entry #2 for the lawnscaping challenge. Here's the entire card, in all of its Christmas glory! I used a martha stewart punch to create my green garland, and distressed the leaves with some brown ink. The white mat was stamped with my vintage wallpaper stamp (marketstreet stamps) - doesn't it look like fabric wallpaper? I also distressed all of the edges. The sentiment is SU. Eeek! I had the idea of making my own little polaroid picture - what do you think? The one that comes with the "say cheese" set (lawn fawn) is too big for the camera to spit out! I drew and cut the tiny polaroid out and then stamped on it using PTI's tiny treats: birthday images. Some distressing around the cake helped to define the "picture area." I cut a slit into the camera using a craft knife and mounted that layer onto my card with foam tape so that the recipient of this card could "play" with it a bit! lawnscaping challenge - it's distressing! I inked up, copic-colored, and cut out the barnyard critters... and that fence! I colored and cut it out also... what I learned is that my craft knife is a smidge on the dull side... I kept wishing that I had the PTI fence die - but this one turned out pretty cute, I think! The clouds backgrounds is a Hero Arts stamp - I inked it up in pool party ink (SU) and used tumbled glass distress ink around the edges. The kraft base was also stamped with a Hero Arts background (envelope pattern) and was then distressed using white ink.